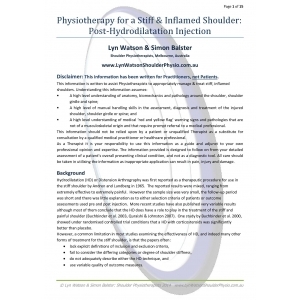 We have distilled our 25 years of clinical experience treating shoulder stiffness, our experiences with Glenohumeral Joint Hydrodilatation injections and the published research into this 15 page article. Who is most likely to respond to a Hydrodilatation? When is the best time to perform a Hydrodilatation? You are purchasing a PDF of the article that can be viewed through Adobe reader. To protect your purchase from widespread dissemination the article is password protected and is unable to be printed. You will recieve an email with the password when you purchase the article. Disclaimer: This information has been written for Practitioners, not Patients. A high level understanding of medical ‘red and yellow flag’ warning signs and pathologies that are not of a musculoskeletal origin and that require prompt referral to a medical professional. 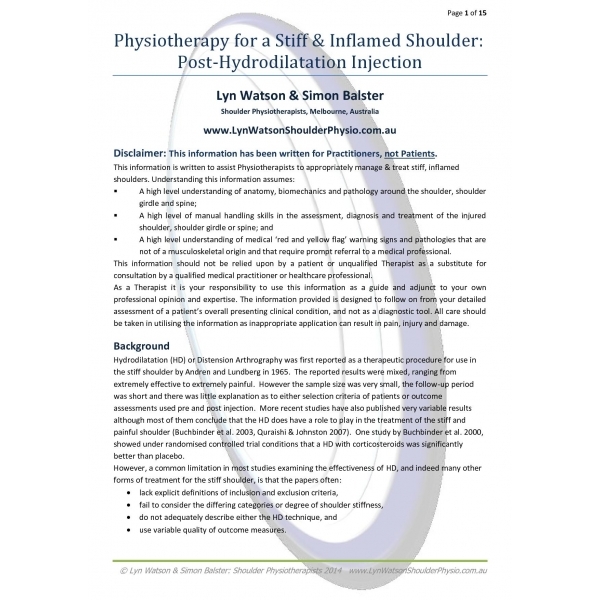 This information should not be relied upon by a patient or unqualified Therapist as a substitute for consultation by a qualified medical practitioner or healthcare professional.